The project is currently in a pilot stage. 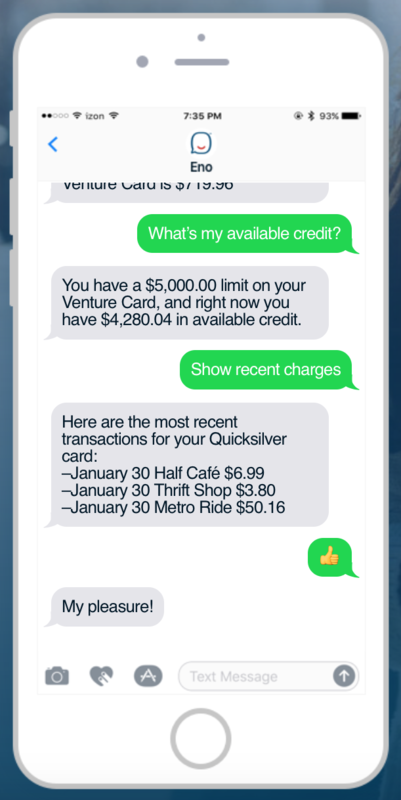 Unlike many other banking chatbots out there, Eno is not available on Facebook Messenger, but uses good old SMS. According to Ken Dodelin, Capital One’s VP of digital product development, 97% of smartphone owners regularly use text messaging. “We want to go where the people are,” he says. Also, customers might not have a Facebook Messenger or other apps installed. To interact with Eno, no app is required. However, choosing the text messaging channel might also be due to the US privacy law regulations for financial institutions. They require a clear record on how personal information gets accessed who can access it, which limits what a bank can offer via its Facebook Messenger-based chatbot. Eno is “one” spelt backwards. The bank says Eno uses artificial intelligence (AI) to respond to text messages from users about their finances, such as checking account balances or requesting a transfer between accounts. It can also recognise emojis. For example, a “bag of money” emoji texted by a customer will prompt Eno to respond with their account balance, or sending a “thumbs up” emoji will confirm a transaction approval to Eno. The chatbot will learn and evolve as more customers use it. If asked about Eno’s gender, the chatbot will say it is “binary”. According to Dodelin, Capital One has deliberately opted for a gender-neutral name, as the proliferation of female names among chatbots/virtual assistants has attracted criticism. Eno does have a favourite colour though. It is green – the colour of money. In the "Age of the Customer", corporate empathy has never been more important. Kevin, Traity’s new chatbot, provides micro-insurance for P2P transactions online. Created in collaboration with Australia’s financial services conglomerate, Suncorp, Kevin protects buyers on online marketplaces such as Gumtree, Facebook and Craigslist.